NBC’s primetime figure skating announcers Johnny Weir and Tara Lipinski promised to wear lots of bling and high heels at the 2018 Olympics Winter Games. Oh, how they've delivered. Halfway through the Pyeongchang Games the former Olympians have dazzled the audience with their sparkly and coordinating outfits, courtesy of their many suitcases. Weir's debut ensemble in the commentator's booth last week featured a bright red sequin blazer while Lipinski wore a matching short dress. 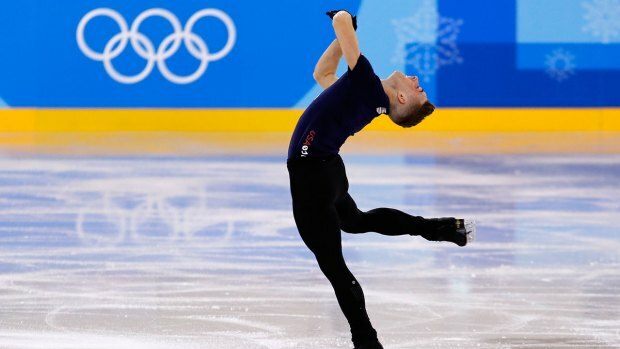 Tara Lipinski and Johnny Weir preview Adam Rippon's 2018 Olympic Winter Games. Next, the duo toned it down a bit, in nearly all black outfits with leather accents. But Weir wore a jeweled harness that added a special flair. Earlier this week, Weir continued to wear dark, shiny blazers and chunky embellished necklaces with Lipinski clad in bodycon dresses. A lighter moment came on Valentine's Day when the duo showed up for their gig in coordinating pink attire: Weir in a white blazer and a hot pink shirt accompanied by a matching necklace and Lipinski in a pastel pink dress. They even got sportscaster Terry Gannon, their “partner in crime," to wear a light pink shirt with his black suit. Not to be missed every day at the Olympics is Weir's hair, usually featuring a blowout with more folds than a Frank Gehry building. During Sunday’s figure skating team event coverage, Weir’s pompadour hairstyle along with a Zadige Voltaire sequin-fitted blazer, black button down shirt and giant necklace had many on Twitter wondering if he should be hosting the "Hunger Games." Weir, known for his eccentric and over-the-top style, set a high bar during the 2014 Sochi Games where he donned multiple sparkly blazers and the golden Coach hair piece. "On camera, you have to bring it," Weir said in a pre-Olympics interview in October. "In this day and age of fashion bloggers and Vogue you really have to make sure that you’re on point every day and not repeating, because people are waiting to see what we’re going to choose." 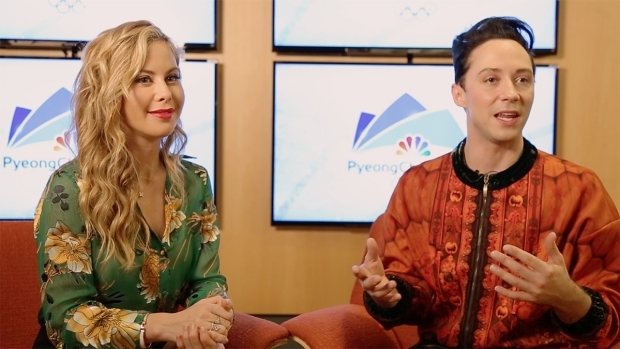 NBC's prime-time figure skating commentators Tara Lipinski and Johnny Weir talk about their fashion inspiration for the Pyeongchang Games, the American figure skaters they're excited to see perform and the hottest rivalries to keep an eye on heading into the 2018 Winter Olympics. Lipinski and Weir said then that they were planning to choose his clothes first and Lipinski’s second so that they can match and create themes. For Rio Games, Weir packed 52 pairs of shorts, 37 pairs of shoes, 26 bathing suits, nine hats and and three pounds of jewels. He might've brought just as many items, if not more, to Pyeongchang. His Instagram photo showed him surrounded by nine bags and suitcases at the airport in South Korea on Jan. 28. What other whimsical outfits are in store?